So said Nils Bohr, Nobel laureate in Physics, perhaps with a touch of irony. And yet every business decision depends on some kind of forecast about the future trends, so it’s important we give it our maximum attention. Usefully for broadband providers, technology trends are reasonably predictable. The growth in multi-screen usage per home, or the adoption of 4K TVs have, by and large, settled into forecastable patterns. There is a firm ground on which reliable forecast on bandwidth trends can be made. For example, statistical data on user behavior, minutes per day spent on watching TV, number of devices per home and their video resolution – and how new generations of devices with higher quality resolution will be adopted over time. However, this still doesn’t make forecasting an easy job as there’s always scope (and hope) for a disruptor on the horizon. It’s part of our job at Nokia to help you plan for the future of your networks. 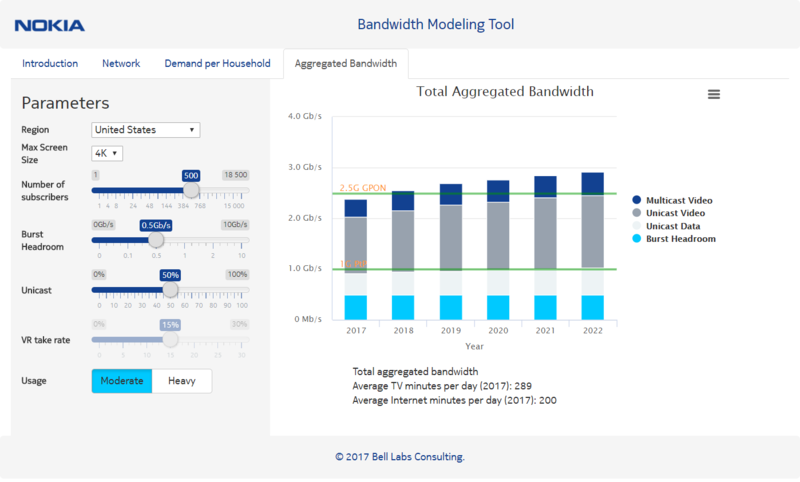 That’s why our experts at Nokia Bell Labs and our Fixed Networks CTO created the Nokia bandwidth modeling tool. And it’s been showing up some really valuable insights. Take virtual reality home entertainment. Still very much in its infancy but starting to pick up in certain geographies. Our modeling tool shows that the addition of a single VR device would take a household’s peak bandwidth requirements from 45 Mb/s to 275 Mb/s1. Aggregate that for a neighborhood and even just 10% of households buying a VR device could double the aggregate bandwidth demand2. We can also predict the effect of 4K and 8K video. 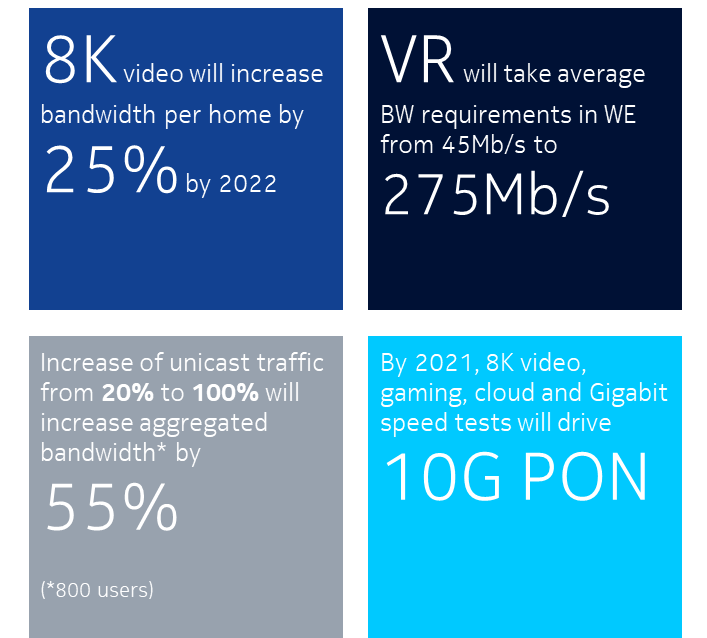 On current forecasts, the adoption of 8K video would result in a 25% increase in sustained bandwidth per home by 2022. Unicast traffic is also on the rise and has a significant impact. The more users in an aggregated network, the bigger the impact of unicast. For example, aggregated traffic from 500 users progressing from 20% unicast to 50% unicast would need 20% higher aggregated bandwidth. For 100% unicast it would be a 55% increase3. GPON is only going to take you so far, especially in heavy-usage areas where 8K video, gaming, cloud and Gigabit speed testing is high. In the US, these areas will need 10 Gb/s PON by 20214. It’s the level of personalization and granularity that is the real power of our bandwidth modeling tool. You can input details about your service areas, change the number of TVs, tablets, smartphones and VR units, vary the level of unicast video traffic and TV screen definition, model different subscriber densities and headroom requirements. It allows you to take trends that we know are reliable and make sound judgments about where and when you need to invest in your network. Have a play with the tool yourself and let us know what you think.